Infer strategies for species management. The results revealed that despite the finch population being stable over 33 years, the lower natural limit remains below zero suggesting that the species is still at risk of extinction. In practical terms, management of the species requires adjusting the status so that lower limits in SBC analysis rise above zero. When such a status is achieved, conservation managers can consider how to maintain low level monitoring of the species (enabling resources to be directed to other concerns), without neglecting the species. Comparisons are given with SBC analysis of other bird species. Imperatives for managing the Nihoa finch include habitat recovery (including pest control), captive breeding, and translocation to create new sub-populations. Conservation management often requires interpretation of limited data on the species or ecosystems of concern.7 In practice monitoring effort is constrained by resource limitations, so there is value in options that allow re-deployment of intensive monitoring (including reduction or even cessation). System Behaviour Charts (SBC), developed from statistical concepts established since the 1920’s8,9 provide insights into the dynamics of natural systems by representing longitudinal plots of existing datasets or newly sampled data.10,11 Various studies have used SBC to identify changes in ecological systems, including population levels for specific species.8,10–12 Analysis of a metric, or a series of metrics, on charts of longitudinal time-series data allows a deeper consideration of specific patterns, including improvements and declines, which can be differentiated from fluctuations derived from underlying statistical ‘noise’, or patterns caused by seasonal cycles, geography or other attributable phenomena. In conservation three situations are of particular interest; stable, unstable and changing systems.8 A fourth scenario in conservation is where a stable system occurs whereby it remains unacceptably vulnerable to stochastic events. An example of this would be a population of a species where, statistically speaking, a zero population could be reasonably predicted from the data. This type if inference can only be gained from looking at patterns of longitudinal data over time. Infer relevant strategies for species management. Population data from 1979 to 2012 for the Nihoa finch were derived from literature.15 For SBCs, 20 or more data points provide useful insight8,17 when plotted on a chart alongside calculated limits (Figure 1). The mean (x̄) of the population counts was plotted as the central line. As in previous ecological studies10,11 the standard deviation (σ) was used to calculate four control limits previously discussed in literature:12 Upper Natural Limit, UNL= ; Lower Natural Limit, LNL= ; Upper Warning Limit, ; Lower Warning Limit, . For further comparison, additional upper and lower limits used in average moving range (XMR) charts were also plotted using the two-point moving range, since such limits can be more sensitive in un-homogeneous data sets,9,17 providing an Upper Limit (MR) and Lower Limit (MR). The position of data relative to the empirically-derived limit lines enables differentiation of routine variations from exceptions and informs judgment of whether a system is predictable and stable, or not, using empirically-derived rules. 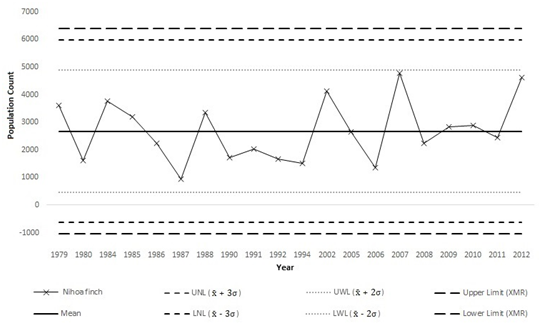 The SBC of population counts for the Nihoa finch revealed that throughout the period from 1979 to 2012 the population remains stable within natural limits (Figure 1), displaying a steady state (i.e. stable system) in line with SBC rules 1-7. However, the eighth SBC rule for conservation requires that where a LNL falls below an acceptable zero (e.g. a population count of zero indicates extinction, so is definitively unacceptable) then the system should be considered as being of concern. In the case of the Nihoa finch, despite a healthy mean population of approximately 2500, both sets of lower limits calculated at x̄ - 3σ and x̄ - 2.66(MR) fall below zero (Figure 1). This indicates that the species may fall to extinction in any future time so continued monitoring is required to avoid any such occurrence. Figure 1 Systems Behaviour Chart of population of Nihoa finch (Telespiza ultima) on Nihoa Island, Hawaii, 1979-2012 , shows lower limits derived from x̄ - 3σ and two-point average moving range (XMR) below zero. New concepts are needed to understand vulnerabilities of species in relation to ecosystem stability and population status20 and this must go beyond experience-based measures of viability. Reliance on perceived declines such as trends or point-to-point variance (on metrics such as population size, structure, range, demographics, food or habitat availability) relies on assumption since it does not consider variation over time. Prioritization of scarce conservation resources involves decision-making in the face of numerous challenges.7 The SBC is an accessible method11 which informs relevant monitoring strategies, encouraging either a continuous approach (e.g. weekly, seasonal or annual sampling) or occasional interventions to assess population status. System Behavior Charts offer a ‘boundary science’21 that bridges the gaps between research and management decision-making, providing a more complete understanding of available data needed to conserve species. It has been noted that many monitoring programs lack empirical definition of tolerable levels of ecological change that would prompt management action when most necessary.22 The IUCN have currently recognized the Nihoa finch as Critically Endangered due to its range restriction and vulnerability to accidental introduction of alien predators, pests, or disease, or a stochastic event such as a hurricane or forest fire.14 However, if the impact of recovery actions for this species is reflected, over time, in a population count demonstrated through SBC with a lower natural limit rising above zero, then progress will have been achieved suggesting that the species can become less vulnerable to such potential threats. This type of longitudinal Systems Behaviour Chart analysis, which is not possible with other charting or predictive methods, enables conservation scientists and decision-makers to get a stronger empirical understanding of species vulnerabilities to threats such as storms, fire or alien species invasion. To support this, further investigation should examine the sensitivity of calculated natural limits based on both moving range and standard deviation, to inform SBC design and application. Systems Behavior Charts provide an empirical understanding of stability and vulnerability, which conservation managers can use to define actions that will achieve, through cost-effective strategies, future status in species’ populations that will more likely withstand unpredictable, stochastic events. The authors acknowledge J Groombridge and G Rodda for recommending reference data sources. The authors have no financial interest nor conflict of interest related to research in this article. Kier G, Kreft H, Lee TM, et al. A global assessment of endemism and species richness across island and mainland regions. PNAS. 2009;106(23):9322–9327. Simberloff D. Why do introduced species appear to devastate islands more than mainland areas. Pacific Science. 1995;49(1):87–97. Pratt TK. Conservation Biology of Hawaiian Forest Birds: Implications for Island Avifauna. UK: Yale University Press; 2009. Scott JM, Mountain S, Ramsey FL, et al. Forest bird communities of the Hawaiian Islands: their dynamics, ecology, and conservation. Cooper ornithological society. USA: Allen Press; 1986. Scott JM, Conant S, Van Riper C. Evolution, Ecology, Conservation and Management of Hawaiian Birds. Cooper ornithological society. USA: Allen Pres; 2001. Rozek JC, Camp RJ, Reed JM. No evidence of critical slowing down in two endangered Hawaiian honeycreepers. Plos One. 2017;12(11):e0187518. Black SA, Groombridge JJ, Jones CG. Using Better Management Thinking to Improve Conservation effectiveness. ISRN Biodiversity. 2013;784701:1–8. Black SA. System Behaviour Charts inform an understanding of biodiversity recovery. International Journal of Ecology. 2015;787925:1–6. Pungaliya AV, Black SA. Insights into the Recovery of the Palila (Loxioides bailleui) on Hawaii through Use of Systems Behaviour Charts. IJAWB. 2017;2(1):1–2. Leslie SC, Blackett FC, Stalio M, et al. Systems Behavior Charts of Longitudinal Data Inform Effective Management in Marine Conservation. JAMB. 2017;6(5):1–3. Gove, AD, Sadler R, Matsuki M, et al. Control charts for improved decisions in environmental management:a case study of catchment water supply in south‐west Western Australia. Ecological Management & Restoration. 2013;14(2):127–134. Bryan WA. Description of Telespiza ultima from Nihoa Island. The Auk. 1917;34(1):70–72. Birdlife International. The IUCN Red List of Threatened Species. UK; 2016. Gorresen PM, Brinck KW, Camp RJ, et al. State–space modeling of population sizes and trends in Nihoa Finch and Miller bird. The Condor. 2016;118(3):542–557. Latchininsky AV. Grasshopper outbreak challenges conservation status of a small Hawaiian Island. Journal of Insect Conservation. 2008;12(3–4):343–357. Wheeler DJ. Understanding variation: the key to managing chaos. 2nd ed. USA: SPC Press; 2000. Wunderle JM. Pre–and post–Hurricane fruit availability: Implications for Puerto Rican parrots in the Luquillo Mountains. Caribbean Journal of Science. 1999;35 (3–4):249–264. Foster KR, Vecchia P, Repacholi MH. Science and the precautionary principle. Science. 2000;288(5468):979–981. Black SA, Meredith HM, Groombridge JJ. Biodiversity conservation: Applying new criteria to assess excellence. Total Quality Management & Business Excellence. 2011;22(11):1165–1178. Davis J, Brock M. Detecting unacceptable change in the ecological character of Ramsar wetlands. Ecological Management and Restoration. 2008;9(1):26–32. ©2018 Pungaliya et al. This is an open access article distributed under the terms of the Creative Commons Attribution License , which permits unrestricted use, distribution, and build upon your work non-commercially.